My mother's UFO, her most beautiful quilt ever. I am "in-training" to finish it. UFO's to a quilter are those unfinished quilts that we haven't finished before moving onto making others. Newer quilt projects are more enticing, and so apparently I am not the only one, it seems, to have UFO's in abundance. WIPs or works in progress may or may not be included among them. 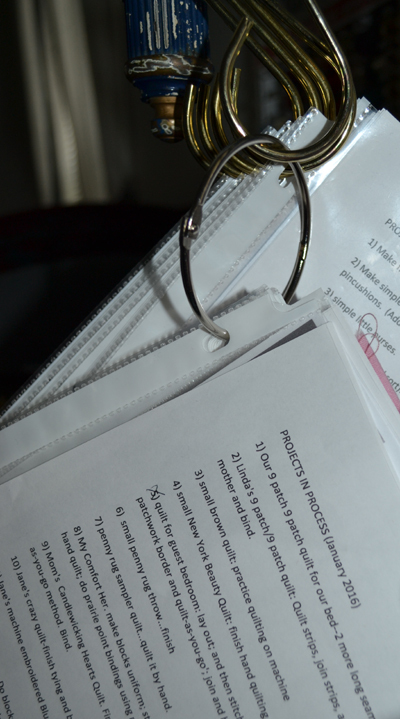 I am working to prioritize my sewing and put all my UFO's onto my WIP or in my case, PIP (Projects in Process) Do-List. I will finish them, if it is the last thing I do, and they may very well be just that!! I have since placed written directions in plastic sleeves to store with them. This alleviates any worry that should I die with them left unfinished, any quilter can pick up where I have left off. I am a control freak enough that I would hope they are finished just as I want them to be finished! "Dream on, Jane Girl!! WIP's or PIP's. No more UFO's! I have a new motto "Finished is better than perfect", though I don't want to spoil any quilts that have great starts and so I am having to learn new skills to actually accomplish what I have started. Perhaps there are other quilters out there that "get stuck" as I do and find myself suddenly in over-my-head and I don't know how to proceed. I would hope I am not the only one that "takes on more than I can chew" or in the case of sewing "more than I can sew"! My mother had only one UFO, and it was her most beautiful quilt ever and foolishly, I agreed to finish it for her so she could die in peace, though I am living without any peace as a result of this commitment!! She was working hard to finish it and was having some real quality control issues and it was too beautiful a quilt to have her push on and potentially ruin what is truly a gorgeous and unusual quilt. 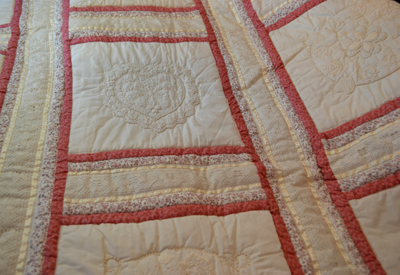 As I hadn't quilted in a very long time, I have been brushing up on my quilting skills and learning new ones, in order to be worthy of finishing her quilt. 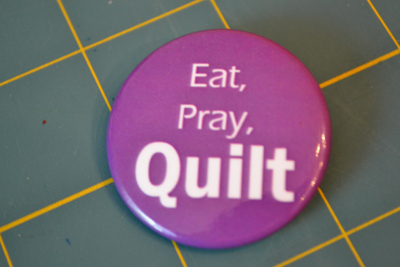 I remind myself that my life' purpose is to eat, pray and quilt! I have been making some new utility quilts to practice machine quilting skills and quilt-as-you-go technique, though my mother's quilts were always done entirely by hand using a similar quilt-as-you-go technique. I have come to terms with the fact that not all my quilts will be hand-quilted as my life span is growing shorter all the time. I often whine now that my other careers should have been abandoned long before they were, no matter that they "earned" a living, unlike quilting, besides you know what they say about hindsight anyway! UFO? You decide! 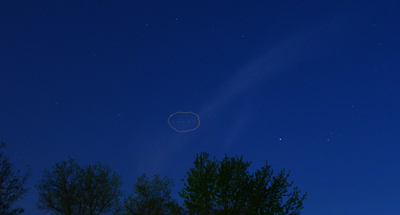 (The circle has been added to help see the mystery lights. 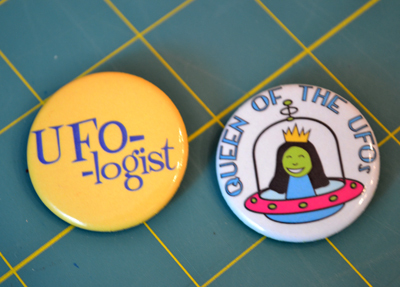 The subject of UFO's seems to be foremost in my husband's world as well...and these are not the quilter's kind! He has been out taking photographs of The Milky Way and other galaxy-sort of subjects, and when he puts them on his computer he is finding strange lights belonging to aircraft, that don't look like ones used by any earthlings that we know. I will try to post a few of them in such a way that my readers can see what we see. They are more impressive when they are blown up larger. 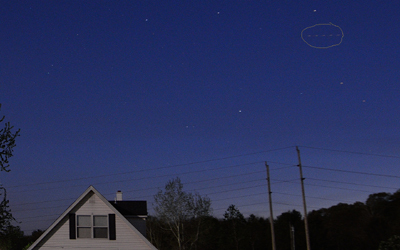 The circle has been added to this picture for viewer's ease to find the UFO. My husband is not seeing them with his naked eye, only in his pictures. I have sent them onto friends, some of whom consider it nothing so surprising, as they just know that we aren't alone in this universe and other's like me, are shocked by any such apparent realities. See circled lights. UFO's or airplanes' blinking lights with slow shutter speed? I have never enjoyed learning about astronomy. The thought of other life forms on other planets is just too big for me to "take in". I remember as a child having to go to our local Observatory Park to view a planet through a telescope. After standing in a line blocks long in the freezing cold winter weather, I finally got my turn to look in the telescope. I had to climb a narrow flight of stairs, and did I mention that I am afraid of heights and only to see nothing. 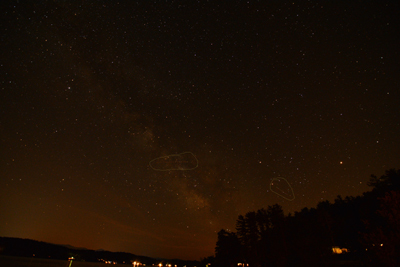 The astronomer kept yelling at others, when they reported not seeing what we were there to see. I falsely reported that I saw whatever it was I was supposed to see though I didn't. I didn't want to be yelled at, though the person after me was more honest and sure enough, the planet had moved, or was it the telescope? My assignment to draw what I saw was lifted from an encyclopedia that was never credited! I preferred to be at home, all warm and cozy doing my needlework! Some things never change! Now, in our home my husband and I have our own TV rooms. He loves science programs, and I prefer chick flicks with a sewing station in my living room, and real "down-to-earth" news programs. I tune into dramas or earth-bound politics, which my husband complains is the lowest of low TV programming. My husband has tried to subject me to such movies as Close Encounters of the Third Kind, Star Wars and the classic TV series, Star Trek. I find their space ships unwarmly decorated and their attire not so attractive either...No "down home" comforts in their world and I understand that that those that have supposedly been abducted find real alien space ships to be similar...rather cold and metallic-like without home warmth and friendliness. It would be my worst nightmare to be abducted, and though I insist that my husband take his "earth anchor" with him, I will only accompany him with a suitcase packed with a favorite cozy quilt and picture of my family in case of abduction. Just thinking about the possibility of unwanted travel in these alien craft, will necessitate me wearing clean underwear with no holes as well! I understand that as an earthling, I might be subject to examinations similar to those at a doctor's office. Clearly they know little about down-home hospitality!! Labels: aliens. Vermont. Out of this world place to live., UFO's. WIP's.